We also supply the Marine industry and DIY Boaties with high quality marine repair and maintenance supplies as well as hire out industrial dustless sandblasters. Check out our stock both on-line and in our showroom. Bradford Marine Brokerage offers a wide range of quality new and used yachts and boats from around Australia and South East Asia. Just click this link to go to our Marine Brokerage website and browse our range of boats. We offer a superior anti fouling service with both removal and replacement as well as first time application for all marine craft. With our dry dock facilities we can have your boat out of the water and finished within days! Mobile Dustless Blasting Equipment – We get the job done much faster and safer for your workers and the environment with the Dustless Blaster keeping your job flowing so it saves you time and money. We come to you! 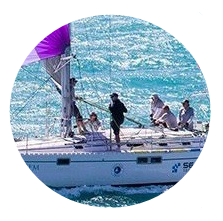 The Team have many years experience on all marine craft and our facilities are conveniently located in the Gold Coast Marine Precinct in Coomera where we have a marine craft pick-up and delivery service available. All of our repairs come with our satisfaction guarantee and our follow up support is second to none. We are stockist for International, Joton and Sigma Antifoul & Coatings. Durepox, Maddox anodes, Farecla detailing products and much much more. We have all the DIY for your antifoul needs with competitive pricing and superfast delivery. Whatever your marine requirements just contact us and we’ll take care of the rest. Bradford Marine pride itself and the best quality workmanship and old fashioned attention to detail. When only the best will do, without the luxury price tag, Bradford is the only choice which is why our clients are clients for life. Quality is important but without expert service and great follow up then you are only getting half the package. Bradford Marine are known Australia wide for our expert service which takes into account your exact needs and makes sure that you get exactly what you want with no fuss or excuses. After we service your marine craft we provide our after repair follow up service just to make sure everything is perfect for your safety and comfort. Want to keep up with everything Marine? Then join our weekly blog feed and RSS feed or just check out it out now and get up to date with the latest news, information, promotions and special offers. Here we provide a range of video tips and advice on the Bradford Marine You Tube channel. You can get the latest advice on boat maintenance and repairs as well as information emergency procedures on the water, the best fishing spots locally and the best times to take your boat on the water. So check them out, we made them for you. I would just like to thank the entire team at Bradford for your outstanding work on my Hampton, it’s now better than new and really is a glamor in the water. I have highly recommended your services to my fellow boaties so I hope you can help them out with the same professionalism shown on my repair. I’ll see you for my 12 mth maintenance follow up early next year. Just wanted to drop you a quick note David to thank you terrific work you did on my hull. I thought that your quote was more than reasonable especially considering the quick turnaround in under a month and delivered back to us ready to go and fully tested. I look forward to seeing you next week for your after repair checks but it’s looking all good to me. Great job David, looks like there was no damage at all! Had it out all day and it seems to be perfect and still glides over the water. I’ll watch out for the reef next time so I hope you won’t be seeing me for a while. To the team at Bradford – Your work on my yacht was exemplary and I found your level of expertise and understanding second to none. After discussion with my captain I’m happy to have Bradford maintain all of my boats and I look forward to a lasting quality relationship. On behalf of the crew of Ocean Gem Racing, I want to say a big thank you for the fine work your team at Bradford Marine do, to keep our hull and keel painted, smooth and fast so we can slice through the ocean at the best possible speed. We have had a lot of racing success after completing more than 300 races in the past four years. There is no doubt your work has helped give us the edge and its nice as an owner that you keep my 26-year-old hull looking like a near new boat. Please pass on my thanks to Marty. Nothing is ever a problem with him and the work is performed to a high standard and on-time. It’s rare these days! Join us on social media for the latest updates, info and offers!